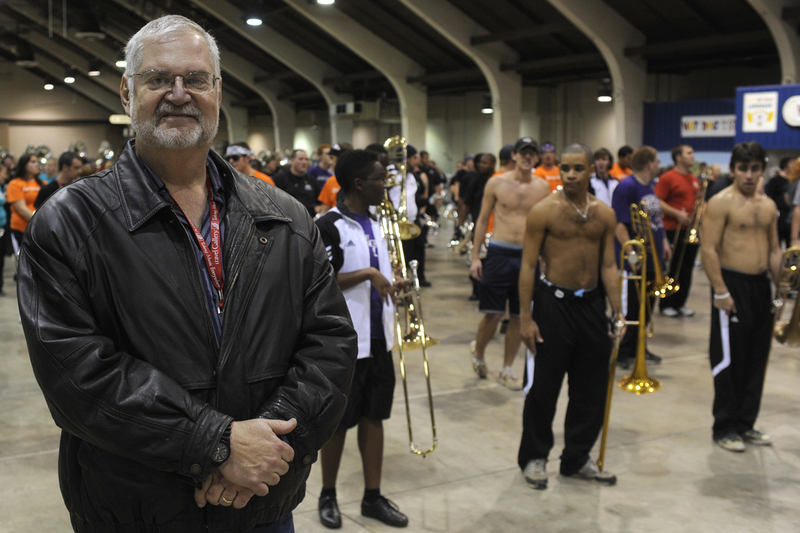 Bill Locklear, who arranges music for the WCU marching band, traveled to California to see them perform at the Tournament of Roses and attended a rehearsal held indoors (pictured) because of rain. For the past 10 years, Bill Locklear has arranged some of the music performed by the Western Carolina University Pride of the Mountains Marching Band – a task that involves incorporating the band’s intense use of electric guitars, keyboards and other uncommon marching band instruments. “It gives the music a completely other dimension,” said Locklear, a retired high school marching band director who arranges music for about two dozen bands each year. Locklear said he was particularly impressed this year when he saw the WCU band perform in late October. “It sounded so fresh that it took awhile for it to come back that I had written some of that,” he said. Locklear decided to make the trip to California to hear the band perform in the Tournament of Roses in part because director Bob Buckner plans to retire this spring. Locklear helped arrange the song “You” written by California ska band Suburban Legends that the Pride of the Mountains will perform in the Rose Parade.